You can schedule a batch marketing email to send at a specific time in your recipients' own time zone. The email will be sent in batches based on your recipients' IP time zone property contact property value. Any contact without a value for this property will receive the email in your account time zone. Please note: this feature is only available for batch marketing emails created in the classic editor. You can't schedule emails based on recipients' time zones in the drag and drop editor or an A/B test email. Hover over the email you want to schedule and click Edit. Click the Send or schedule tab. Select Schedule based on time zones. Select the date and time when the email should be sent. To see a preview of when your emails will be sent to each time zone, click Check recipient time zones. The time shown in the Scheduled time column is based on your own time zone. 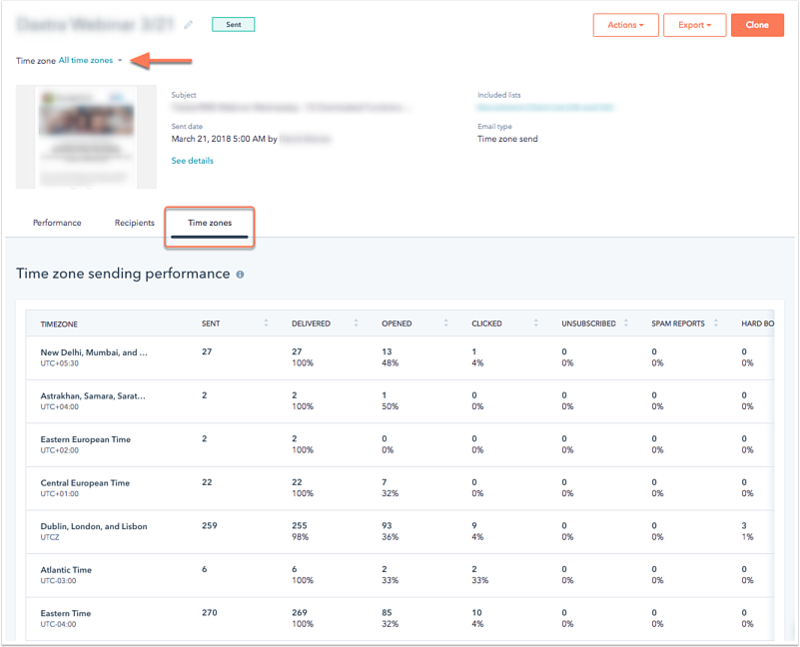 On the post-send details page, you can analyze your email's performance in all time zones or a specific time zone. Click the name of your sent email. Click the Time zone dropdown menu to see data in the Performance or Recipients tab for a specific time zone. Click the Time zones tab to see the email's performance across all time zones. Please note: you can't use the send to more feature on an email that was sent based on your recipients' time zones. Instead, clone the email to send it to additional recipients.